Ghost pigs can be strangely agreeable. Despite very nearly constituting a food group unto themselves, pigs are believed to be one of the most intelligent creatures on the planet, far surpassing domestic dogs and cats, rivalling chimpanzees and dolphins for basic smarts, abstract thinking, and social cooperation. Their fatal shortcoming is that they taste delicious. In the distant past, they managed to negotiate their way onto Semitic non-halal lists. This of course was not a hard sell since pigs don’t have sweat glands, requiring sufficient water to keep them cool, and Judaism and Islam originated in desert regions, making the pig an impractical and resource intensive source of meat. We lack detail on porcine metaphysics, thus it’s difficult to understand what a swineful conception of the afterlife would look like. Presumably it would involve a lot of mud and slops. Since the persistence of consciousness after death seems a fairly fundamental prerequisite to being a ghost, as one of the more acutely conscious critters rooting around on the globe, one would expect to encounter pig phantasms every now and again. The relative absence of animal ghosts (we have lots of animal “monsters”, but far fewer identified explicitly as ghosts) in the Western world no doubt is wrapped up in the enduring influence of the scholasticism of Thomas Aquinas (1225-1274 A.D.) and the relative dominance of the Catholic Church in Europe until the Reformation, who following Aristotle rather finely parsed the question of whether animals had souls, concluding that indeed they had a basic anima we would call a soul, but that human souls are uniquely immortal among living creatures. This put some rather serious limitations on animal afterlife. There is a more practical reason why we shy away from animal phantoms. As the white-sheeted symbol of a ghost was largely an Elizabethan theater trope to let folks know that something spectral this way came, the primary ways in which we’ve traditionally identified a ghost are (1) we know the person, and they are definitely already dead, and (2) anachronistic fashion e.g. if you see a Confederate soldier wandering down the streets of 21st Century Atlanta, he’s either a committed re-enactor, a marketing campaign, or a ghost. Except in cartoons and certain high income enclaves, animals generally prefer to go au naturel, seriously limiting the more obvious clues we would use to identify likely incorporeality. As very few of us are on a first name basis with our pork, it is hard for us to determine if any particular pig is the one we knew well. Thus, we are far more hesitant to call a swine a specter without a convincing backstory or other obvious indications of the preternatural (vanishing, walking through walls). Given the extraordinary number of pigs who have given themselves, body and soul, to the frying pan, one would expect more frequent phantom pig encounters than can be unearthed in the literature. As we don’t like to think about the possibility of our ill-treated breakfast meats haunting us, it is altogether unsurprising that the relatively few documented pig ghosts are held to be lurking about as the result of a less culinary demise, as in the case where “a lane in Hertfordshire was—and, perhaps, still is—haunted by the phantasm of a big white sow which had accidentally been run over and killed. It was occasionally heard grunting, and had the unpleasant knack of approaching one noiselessly from the rear, and of making the most unearthly noise just behind one’s back (O’Donnell, 1913, p216). I guess embracing one’s inner roadkill constitutes adequate reason for hauntiness, whereas conversion to sausage is considered a natural death and a clear example of going gentle into that good night. The beautiful Chiltern Hills of South East England are reputed to be the home to an entire heard of spectral swine, especially attracted to a cemetery for criminals, uncharitably associated with the location due to an existential simpatico with the rough and tumble vagabonds interred there, rather than any presumed resentment over their conspicuous consumption. The Phantom Pigs of the Chiltern Hills: A good many years ago there was a story current of an extraordinary haunting by a herd of pigs. The chief authority on the subject was a farmer, who was an eye-witness of the phenomena. I will call him Mr. B. Mr. B., as a boy, lived in a small house called the Moat Grange, which was situated in a very lonely spot near four cross-roads, connecting four towns. The house, deriving its name from the fact that a moat surrounded it, stood near the meeting point of the four roads, which was the site of a gibbet, the bodies of the criminals being buried in the moat. Well, the B’s had not been living long on the farm, before they were awakened one night by hearing the most dreadful noises, partly human and partly animal, seemingly proceeding from a neighbouring spinney, and on going to a long front window overlooking the crossroads, they saw a number of spotted creatures like pigs, screaming, fighting and tearing up the soil on the site of the criminals’ cemetery. The sight was so unexpected and alarming that the B’s were appalled, and Mr. B. was about to strike a light on the tinder-box, when the most diabolical white face was pressed against the outside of the window-pane and stared in at them. 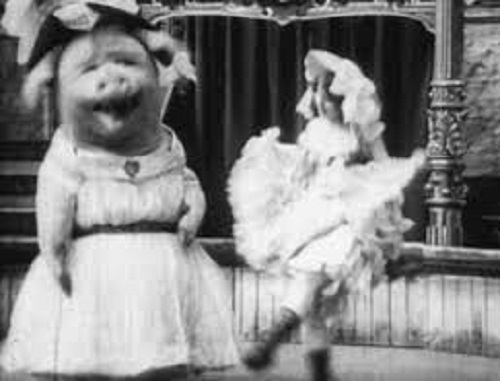 This was the climax, the children shrieked with terror, and Mrs. B., falling on her knees, began to pray, whereupon the face at the window vanished, and the herd of pigs, ceasing their disturbance, tore frantically down one of the high roads, and disappeared from view. Similar phenomena were seen and heard so frequently afterwards, that the B’s eventually had to leave the farm, and subsequent enquiries led to their learning that the place had long borne the reputation of being haunted, the ghosts being supposed to be the earth-bound spirits of the executed criminals. Whether this was so or not must, of course, be a matter of conjecture—the herd of hogs may well have been the phantasms of actual earth-bound pigs—attracted to the spot by a sort of fellow-feeling for the criminals, who’s gross and carnal natures would no doubt appeal to them (O’Donnell, 1913, p214-216). In old Scandinavian traditions, the ignominy of being turned into a pork product is outweighed by the far more gruesome prospect of being buried alive in a churchyard as a throwback to sanctification through animal sacrifice, and while not limited to the pig, apparitions of critters thusly treated have been known to occasionally wander the streets. Another form of spectre animal is the kirk-grim, which is believed to haunt many churches. Sometimes it is a dog, sometimes a pig, sometimes a horse, the haunting spectre being the spirit of an animal buried alive in the churchyard for the purpose of scaring away the sacrilegious. Swedish tradition tells how it was customary for the early founders of Christian churches to bury a lamb under the altar. It is said that when anyone enters a church out of service time ho may chance to see a little lamb spring across the choir and vanish. This is the church lamb, and its appearance in the churchyard, especially to the gravedigger, is said to betoken the death of a child. According to a Danish form of this superstition, the kirk-grim dwells either in the tower or wherever it can find a place of concealment, and is thought to protect the sacred building; and it is said that in the streets of Kroskjoberg, a grave-sow, or as it is also called, a ‘gray-sow,’ has frequently been seen. It is thought to be the apparition of a sow formerly buried alive, and to forebode death and calamity (Dyer, 1893, p122-123). Slightly less disconcerting are those companionable phantom pigs that are simply out for an undead stroll, the only indication of their essential ghostly qualities being that almost nobody noticed them. Of course, rampant swine fever was noted at the time, which perhaps constitutes a somewhat less than glorious death for a pig. November 2nd, 1907:— Hoe Benham, Newbury. On November 2nd, 1907, I was painting in the Studio with my friend Reginald Waud; the model was our servant dressed as a widow, and we were waiting for Miss Miles to join us. At 10 o’clock I knew the milkman had come by the dogs barking in the cottage at the top of the garden. So I said, ‘I will take the milk in,’ and went up to the cottage. After putting the jug in the pantry and shutting the cottage door, I looked up the road and saw Miss Miles coming down with her easel and paint-box. Following quite close behind her was a large white pig, with a long snout. I went down to the Studio and said to Waud, ‘What do you think Miss Miles is bringing down with her this morning, instead of her Chow? A large pig.’ We roared with laughter, and he said, ‘Call out and tell her not to bring her friend in, and to be sure to shut the gate, as we take a great pride in our garden.’ The moment Miss Miles appeared I opened the window and shouted out, ‘What have you done with your companion?’ She was very surprised and said, ‘My companion! What do you mean?’ Then I told her what I had seen following her. She immediately said, ‘ If a pig were trotting behind me, I must have heard it. Besides, there is a very easy way of finding out, for I passed the milkman in the lane and he must have seen it, but I shall go and look for myself.’ When she came back she said, ‘There is no trace of a pig anywhere.’ We made enquiries all over the village; no one had seen a stray pig. There is only one white one in the place, and this one, its owner assured us, could not possibly have got loose without his knowing it. At the present time there is a notice out forbidding owners to allow pigs to stray, under penalty of a fine, as there have been cases of swine fever. We enquired of the milkman next morning. He remembered passing Miss Miles, as he usually met her about the same time. He most emphatically said there was no pig to be seen anywhere on the road. (Signed) Osmund Pitthan (Podmore, 1910, p66-67). Thomas, Aquinas, Saint, 1225-1274. On the Truth of the Catholic Faith: Summa Contra Gentiles. Garden City, N.Y.: Hanover House, 1955. O’Donnell, Elliott, 1872-1965. Animal Ghosts; Or Animal Hauntings & the Hereafter,. London,: W. Rider & son, 1913. Podmore, Frank, 1856-1910. Telepathic Hallucinations: the New View of Ghosts. New York: Frederick A. Stokes company, 1910. Reminds me of William Hope Hodgson’s “House on the Borderlands” (1908) and “The Hog” ( Hodgson died in 1918but the story did not see publication until 1947). The Great Hog is a cosmic horror from another dimension. The description of ghostly pig like creatures , the eerie almost human grunting sounds, and the face at the window certainly sound like they were derived from Hodgson’s work. Edgar Cayce claimed while in “trance”, that ancient “Atlantean” civilization created genetic hybrids and semi-evolved animals that were the basis of mythology & legends. One of their experiments involved creating some kind of pigs, and part of the rules forbidding eating pork meat goes back to this in some manner. The mind can call up some powerful images and archetypes.